Let the 12 Days of Christmas countdown begin! Besides decorating our Christmas tree, hanging our stockings and shopping for presents, I have created many holiday traditions with my children. Here are some simple ideas to create traditions this holiday season and for years to come with your family. 1. Add a Countdown to Christmas Calendar to your kids’ morning. 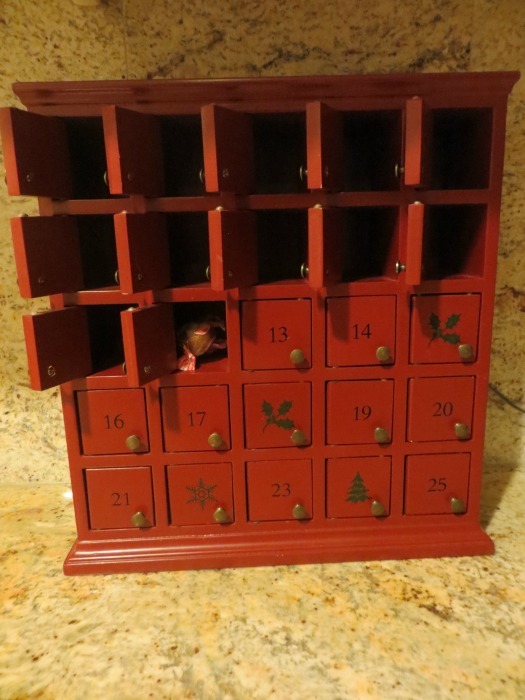 Your kids will race down each morning in December and open up a special door which holds a special treat, prize or “coupon” for a special activity. Available at various specialty and gift shops. 2. Watch classic Christmas movies with popcorn. Tip: sprinkle it with cinnamon and sugar for an extra sweet treat! My favorite Christmas movie is Miracle on 34th Street (1994 version), which has quickly become my daughter’s favorite, as well. My son prefers Elf! 3. Make and design an EASY Gingerbread Village! This simple recipe was adapted from my daughter’s Girl Scout Troop for the last six years and we never went back to the classic gingerbread house recipe. 4. 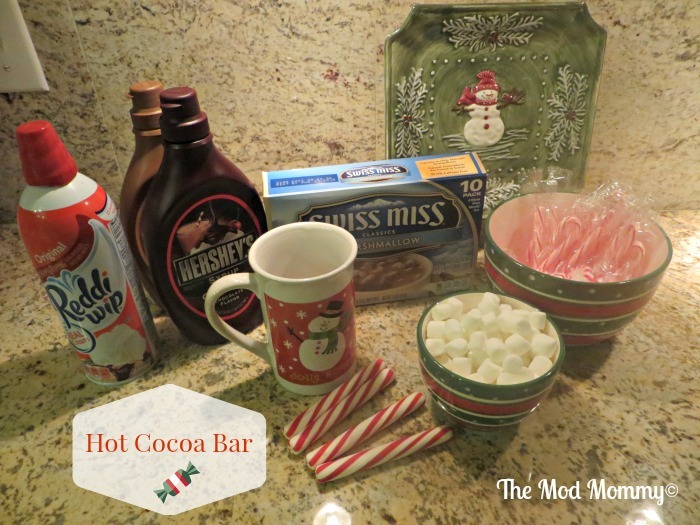 Warm up with a Hot Cocoa Bar while reading Christmas stories in your cozy holiday PJs. Some great Christmas story books include: Polar Express or ‘Twas the Night Before Christmas. Set up instant hot cocoa packets, hot water or milk, whipped cream, chocolate and caramel sauce, chocolate chips, sprinkles, mini marshmallows and mini candy cane sticks. 5. Bake traditional Italian cookies – Each year we make Wine Biscuits, Egg Biscuits, and Almond Biscotti. 6. Visits with Santa. 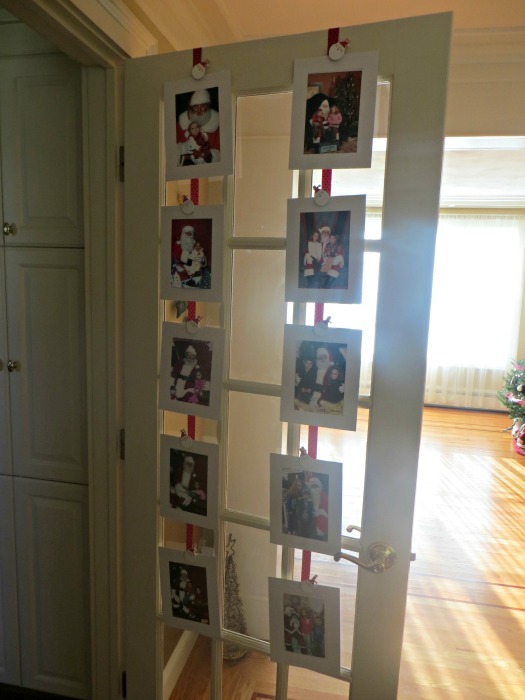 Hang the classic Santa visit pictures each year on a door or wall to see how the kids have grown! We are on our 11 year! (Important Parent Tip: Not to blow the “secret”, make sure you visit the same “Santa” each year…I did not take my own advice! 7. Decorating Classic Sugar Cookies with the kids – the easy way! Buy rolled sugar cookie dough, rollout, make cut outs, bake and decorate! The kids won’t appreciate the dough from scratch…they just want to decorate them! 8. Make homemade easy and affordable treats for kids to give as gifts. These would be fantastic for teachers, assistants, caregivers, bus drivers, volunteers, coaches, neighbors, and anyone else who helps them out every day! 9. Host a Christmas themed breakfast. Make Reindeer Pancakes! 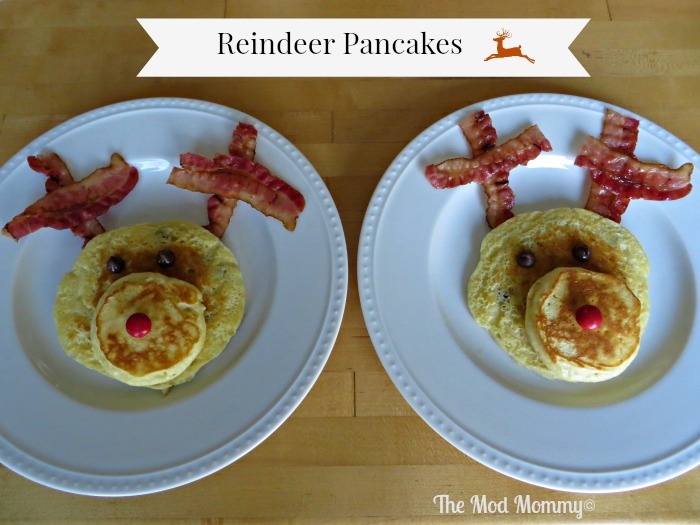 Have kids assemble reindeer pancakes by using the picture above! 10. Adopting children for Christmas. Our family usually adopts children from our school and church’s Giving Tree, in addition, many local stores and events host toy and clothing drives. Let’s teach our kids how to give back to the community. 11. Take a neighborhood Christmas lights tour while listening to Christmas music! 12. Make Reindeer Food! Kids will love to help and sprinkle this magic food on the lawn on Christmas Eve. Kids can scoop oatmeal and glitter or cookie crystals into treat bag, tie with ribbon and add label. Makes for a cute classmates or teammates gift! 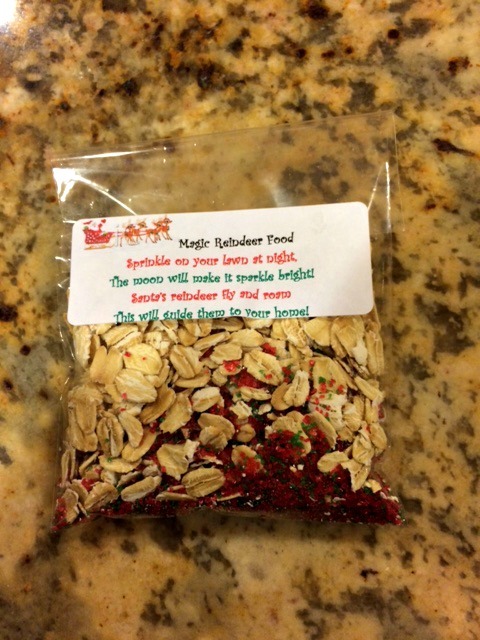 Have your children spread the Magic Reindeer food on your lawn on Christmas Eve! What kind of family traditions do you have during the holiday season?